"Costa Concordia", "Santuario dei Cetacei", "marine", "oil spill"
Fuel extraction through underwater pumping operations began on February 12, 2012 to remove some of the fuel on board. As of Sunday, February 19th, the first phase of fuel removal from the capsized cruise liner had been completed. Prior to the fuel extraction, however, a thick film of oil had spread from the ship due to weather conditions: “Floating barriers placed around the ship to protect the water were lifted by winds, allowing the oily film from the ship to spread throughout the bay… The Italian Port Authority said the leak consisted of a thin sheen of hydrocarbons.” Civil Protection director Franco Gabrielli, however, told the Italian Senate that “although they [the parameters of the water surrounding the wreckage] are not those of crystalline water, [they] are within the legal limits and at the moment there are no dangers for the environment.” The water may be within the “legal limit,” but is it too late for those animals and our environment that may depend on water above this arbitrary “legal limit”? Perhaps that avoidance should come from greater regulations regarding navigation through certain protected areas of water, such as this marine park in Europe. In the meantime, however, we must cross our fingers and hope that Mother Nature cooperates as the remaining fuel is removed from the Costa Concordia wreckage. Two-thirds of Costa Concordia Fuel Removed, CBS News (Feb. 19, 2012), http://www.cbsnews.com/8301-202_162-57381083/two-thirds-of-cosa-concordia-fuel-removed/. Alessandra Migliaccio & Marco Bertacche, Costa Rushes to Remove Fuel, Avoid Spill From Stricken Ship, Bloomberg (Jan. 17, 2012, 7:53 AM), http://www.bloomberg.com/news/2012-01-16/carnival-races-to-prevent-fuel-spill-from-stricken-liner-into-marine-park.html. 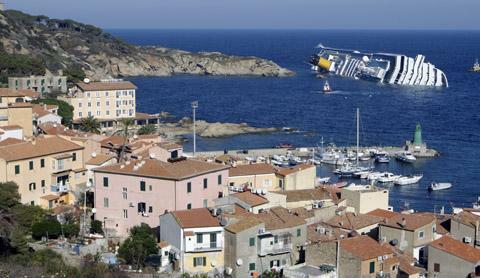 Costa Concordia Death Toll Hits 17, The Sydney Morning Herald (Jan. 29, 2012), http://www.smh.com.au/world/costa-concordia-death-toll-hits-17-20120129-1qnng.html. Two-thirds of Costa Concordia Fuel Removed, supra note 1. Migliaccio & Bertacche, supra note 2. Fuel Removal Under Way at Costa Concordia Site, USA Today (Feb. 12, 2012, 1:05 PM), http://travel.usatoday.com/cruises/story/2012-02-12/Italy-president-demands-justice-for-cruise-ship-victims/53059544/1. Two-thirds of Costa Concordia Fuel Removal, supra note 1. Fulvio Paolocci & Vanessa Gera, Oil Spreads from Wreck of Ship Off Italy Coast, SeattlePI (Feb. 1, 2012, 11:43 AM), http://www.seattlepi.com/default/article/Oil-spreads-from-wreck-of-ship-off-Italy-coast-2911393.php. Waters Around Wrecked Costa Concordia OK, UPI (Feb. 7, 2012, 10:22 AM), http://www.upi.com/Top_News/World-News/2012/02/07/Waters-around-wrecked-Costa-Concordia-OK/UPI-20201328628141/.